Please note there are more than 1.5 BILLION possible combinations of components in our Wheel Builder program. If loading is slow, please be patient. If the program stops working, use Ctrl+F5 (Cmd+F5 on mac) to refresh the page. If that doesn't work, please let us know and we will do our best to find the source of the problem. 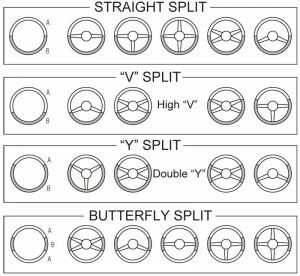 You will find detailed information below for each of our four custom steering wheel styles. All of the choices and options available for each series can be found there along with a link to the Wheel Builder program. All Standard Choices are included in the base price of each custom steering wheel and the cost of Options and Upgrades are shown when you design your custom steering wheel in the build program. All of our custom steering wheels have a 15” outer diameter and with the exception of the C1 Corvette wheels, use a standard three-bolt mounting pattern. If you should have any questions, please contact us at wheels@con2r.com. Base price $345.00 plus shipping. Standard spoke patterns shown – all frames are chrome plated steel with a “3-bolt” mounting pattern. Offset is measured from the back face of the frame hub to the centerline of the grips. Consideration should be given to turn signal and shift levers – if they are column mounted – and the length of an adapter may add to a steering column. We offer 15 solid colors of our ABS injected molded grips. They are 15” outside diameter with finger grooves on the rear grip. They are color matched here but colors vary from screen to screen. If you require a perfect color match samples are available in the CON2R store. We offer 15 colors that match our grips along with a chrome plated die-cast cover. They are color matched here but colors vary from screen to screen. If you require a perfect color match samples are available in the CON2R store. 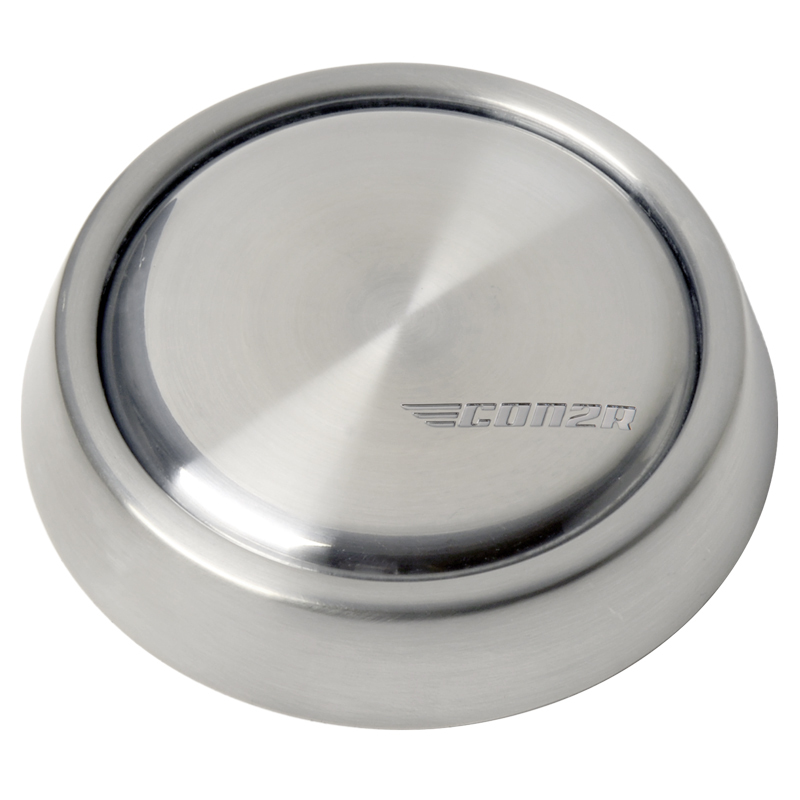 There are 11 available trim styles that are die-cast and chrome plated. They are approximately 4” long an available separately to use for other purposes. All of our Series One steering wheels are provided with a die-cast, chrome plated horn button that is embossed with our logo. We can split the colors on front grips in any pattern you desire. Colors are separated by die-cast chrome bezels. The bezels can also be used to add a decorative touch to single color grips. Cast in-house from black urethane, our domed spokes are available on any of our Series One steering wheels - regardless of offset or spoke pattern. 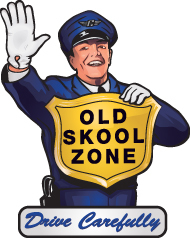 Also available with custom paint or a “Soft Touch” finish upon request - this new option from the Old Skool Zone provides a classic and unique look. Custom colors can be added to your steering wheel either by painting or powder coating. Details can be found in the Wheel Builder program. Our "Soft Touch" finish makes the finish on your steering wheel feel softer as well as give it a soft matte finish. This urethane coating is highly scratch and mar-resistant and can be applied to your entire wheel or just select parts of it. Our ability to use multiple species of wood on a wheel allows you to create an absolutely unique look with classic styling for your ride. More about how they are made and how you can personalize them can be found in the Wheel Builder program. Your steering wheel can be given a full leather wrap using your leather or one of our standard colors. For the ultimate in driving comfort we offer a silicon rubber core that goes over the frame and under the leather. From an elegant blank button to complete custom creations, we can provide what you want to complete your steering wheel design. There are several modifications we can make to your horn button. We can customize your's in any way imaginable. Here are the most common methods. Our chrome plated steel trim rings add an extra measure of style to any of our steering wheels. Full rings are available with any spoke pattern and partials are available in any “spoke-to-spoke” arrangement you specify. All of our Banjo steering wheels are provided with a die-cast, chrome plated horn button that is embossed with our logo. Base price $225.00 plus shipping. Standard spoke patterns shown – all frames are brushed stainless steel with a “3-bolt” mounting pattern. Any of our SERIES TWO steering wheels are available in two different spoke styles. All of our Series Two steering wheels are provided with a die-cast, chrome plated horn button that is embossed with our logo. Our hand-polished Series Two frame combines a mirror shine with the strength and durability of stainless steel. If it is ever scratched or faded, just buff it back to its original luster. Available on all Series Two spoke patterns and styles. Base price $235.00 plus shipping. Our hand-polished Corvette frame combines a mirror shine with the strength and durability of stainless steel. If it is ever scratched or faded, just buff it back to its original luster.